Slice and cutaway movies and the inspeCTor applet are now available for this species! Chalcides ocellatus, the ocellated or eyed skink or 'gongilo', occurs in southern Europe, northwest Africa, and western Asia. Ocellated skinks inhabit a variety of habitats in which sandy ground is present -- coastal areas, among dunes, in vineyards or olive groves -- and may shelter in crevices in dry stone walls, holes in the ground, and matted undergrowth. They can even be found in ruins, such as the Acropolis, and garbage dumps. Chalcides comprises 24 species differing mainly in their degree of limb reduction and body elongation. Northern Africa is thought to be the center of the evolution of this lineage. Analysis of genetic variation within the C. ocellatus group (Caputo et al., 1999) suggests that it may actually contain six reproductively isolated species: C. ocellatus (southern and eastern Morocco, throughout the Mediterranean basin, central and southern Sahara, and eastern Africa as far as Pakistan); C. polylepis (wetern Morocco from the Atlas mountains to the Atlantic coast); C. colosii (northwestern Morocco across the Rif mountains); C. montanus (northern Morocco, across the High and Middle Atlas mountains); C. parallelus (endemic to northeastern Morocco and northwestern Algeria); and C. bedriagai (endemic to the Iberian peninsula). Chalcides is a live-bearing, or viviparous, lineage. Viviparity is not uncommon in squamates: it has in fact evolved independently over 100 times within the clade, and approximately 20% of squamate species are viviparous. However, some species of Chalcides actually develop a complex placental connection between the mother and embryo through which the embryo receives most of its nutrients. Chalcides ocellatus is a member of Scincidae, the largest 'family' of extant lizards (see also Eumeces fasciatus, the five-lined skink). Scincidae includes over 1200 species, occurring on all continents except Antarctica. Skinks are diagnosed in part by the presence of compound osteoderms dorsally and ventrally. These are quite apparent in the animations above, but obscure other skink features like closure of the supratemporal fossa primarily by the postfrontal, and jugal-squamosal contact on the supratemporal arch present or close. High-resolution X-ray computed tomography makes it possible to digitally remove these osteoderms to facilitate the study of cranial structure. Animations of C. ocellatus with the osteoderms digitally removed can be found in 'Additional Imagery'. Within Scincidae, Chalcides resides within Scincinae, a group that includes roughly 28 genera but may not be monophyletic. Scincinae (or some portion thereof) is thought to be the most basal divergence within Scincidae, thus C. ocellatus was scanned because it closely brackets this ancestral node. This frozen specimen originated in the pet trade and no locality information is available. It was made available to the University of Texas High-Resolution X-ray CT Facility for scanning by Dr. Jessie Maisano of The University of Texas and Dr. Jacques Gauthier of Yale University. Funding for scanning and image processing was provided by an NSF grant (DEB-0132227) to Dr. Jack Sites of Brigham Young University. The specimen was scanned by Matthew Colbert on 23 July 2002 along the coronal axis for a total of 630 slices, each slice 0.0409 mm thick with an interslice spacing of 0.0409 mm. Blackburn, D. G. 1993. Chorioallantoic placentation in squamate reptiles: structure, function, development, and evolution. Journal of Experimental Zoology 266:414–430. Caputo, V., B. Lanza, and R. Palmieri. 1995. Body elongation and limb reduction in the genus Chalcides Laurenti 1768 (Squamata Scincidae): a comparative study. Tropical Zoology 8:95-152. Caputo, V., M. Sorice, and L. Crescimbeni. 1999. A molecular taxonomy of some Mediterranean scincid lizards, genus Chalcides Laurenti 1768 (Reptilia, Scincidae). Russian Journal of Herpetology 6:23-32. Greer, A. E. 1970. A subfamilial classification of scincid lizards. Bulletin of the Museum of Comparative Zoology 139:151-183. Greer, A. E., V. Caputo, B. Lanza and R. Palmieri. 1998. 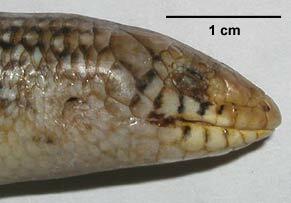 Observations on limb reduction in the scincid lizard genus Chalcides. Journal of Herpetology 32:244-252. Leviton, A. E., S. C. Anderson, K. Adler, and S. A. Minton. 1992. Handbook of Middle East Amphibians and Reptiles. Society for the Study of Amphibians and Reptiles, New York. Mermer, A. 1996. 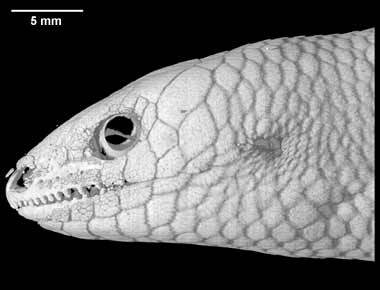 The cranial osteology of Chalcides ocellatus (Sauria: Scincidae) in Anatolia. Turkish Journal of Zoology 20:259-264. Pasteur, G. 1981. A survey of the species groups of the Old-World scincid genus Chalcides. Journal of Herpetology 15:1-16. Three-dimensional volumetric renderings of the skull with the osteoderms digitally removed. The 'scratched' sections indicate where the osteoderms contact the skull. All are 2-3mb. 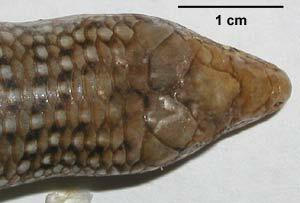 To cite this page: Dr. Jessie Maisano, 2006, "Chalcides ocellatus" (On-line), Digital Morphology. Accessed April 25, 2019 at http://digimorph.org/specimens/Chalcides_ocellatus/.